Bring all your things inside a drawstring bag! Rigid ones should be avoided because they are difficult to store. Bed linen is included in our offers. Boat can suddenly cold even in summer do, especially if you surf at night, and it is appropriate to have leaders to overlap each other. Long-sleeved shirts read that protect from the sun if necessary, comfortable and lightweight pants, even long anti sunburn. For the evening boat, a sweat-suit is ideal! Boat hands: if you are going to lend a hand in the maneuvers, get yourself a pair of good gloves by boat, are very useful, but all in all. There will not be needed! A good coat of adequate heaviness in the season. Not to be confused with waxed sheltering from the water but very little from the cold. Swimwear .. will be your second skin! So take at will! Normally the boat shoes … are NOT ever use! It is not a sailboat full of pitfalls and little living space .. but it is a catamaran .. and will not need them !! So .. unless there are medical reasons … should be abolished! However useful a pair of rock shoes, you can bathe without problems. Even the rubber sandals can go. And ‘it caused by the movement of the boat on the waves and its unexpected changes, which the physicist especially at the beginning is not used. The symptoms may be nausea, cold sweat, vomiting, drowsiness, inability to move for fear that the discomfort increases, and the like. Giving stomach can help you get through and also to lie with closed eyes, as well as being air and watch the horizon avoiding looking down with the boat moving. The place that causes more distress at sea is below deck so if avverttite uncomfortable fled outside or lie down immediately. – Alternative Remedies: bracelets for wrists, according to the principles Shiatsu (in some cases do not work but they help a bit). 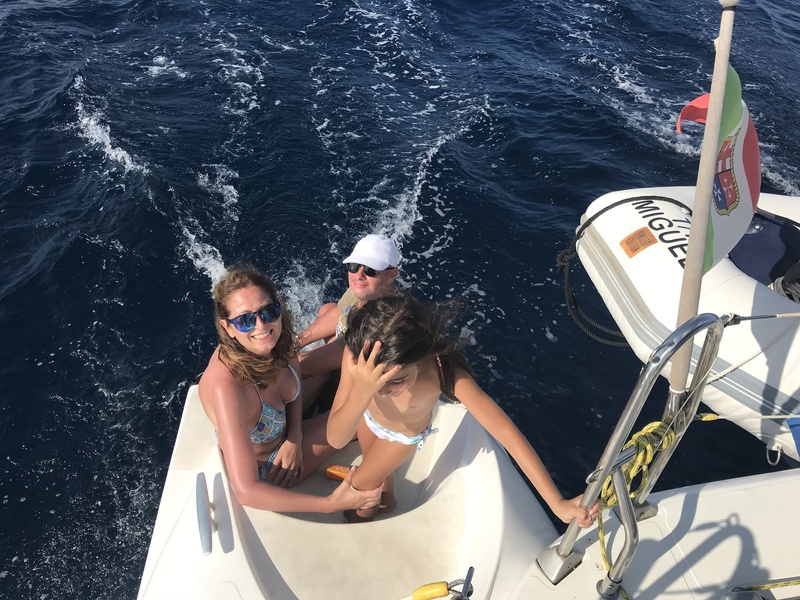 natural defenses to seasickness: eat little and often especially dry foods, crackers, biscuits, bread, biscuits is surely help; eat light healthy, few alcohol … and drink when you are thirsty! Prince remedy if the malaise catches you in navigating Put yourself at the Helm! Those that you normally use, and may be useful. towel and / or shower towel (not advise the bathrobe! ), and good cruise! The board resources are limited, especially the WATER and the ‘ELECTRICITY, not waste them! You’ll find that while you soap your hands there is no reason to leave the open water, which to rinse the sea water from the body … it only takes less than that of the house! Pay attention to the lights on in empty car does not help anyone, and so on … Probably going home you will realize how much we waste resources normally. If we are in port we can “squander a little more. If you smoke, do it, and downwind always open and do not throw the filters into the sea, put us a few years to digest! If you do not cook, everyone will appreciate your offer to wash the dishes and tidying .. unless you have not asked the hostess! If you can not do one thing not to do it before you have asked for an explanation, improvising can create problems. And finally: After dinner drink a glass of Mirto, better TWO! But remember to offer it to others and to have checked the stocks in the galley!